SpaceX’s Dragon spacecraft departed the space station with 3,700 pounds of cargo Feb. 10, 2015, for a 7:44 p.m. EST splashdown in the Pacific, 259 miles southwest of Long Beach, California. SpaceX’s Dragon cargo spacecraft splashed down in the Pacific Ocean about 7:44 p.m. EST Tuesday 259 miles southwest of Long Beach, California, with nearly 3,700 pounds of NASA cargo, science and first-of-its-kind technology demonstration samples from the International Space Station. The Dragon spacecraft will be taken by ship to Long Beach, where some cargo will be removed and returned to NASA. Dragon will then be prepared for a return trip to SpaceX’s test facility in McGregor, Texas, for processing. “The ability to resupply and return this critical research continues to be an invaluable asset for the researchers here on Earth using the International Space Station as their laboratory in orbit,” said Kirt Costello, deputy chief scientist for the International Space Station Program at NASA’s Johnson Space Center in Houston. Flight controllers in the Mission Control Center at Johnson robotically positioned Dragon safely away from its docking port earlier Tuesday, where it was released for its deorbit maneuver, sending it on its way to a parachute-assisted splashdown. Among the returned investigations were printed parts and hardware from the first technology demonstration of 3-D printing in space. The 3-D printer demonstration used relatively low-temperature plastic feedstock on the space station. The test phase ended with a printed ratchet wrench made with a design file transmitted from Earth to the printer. 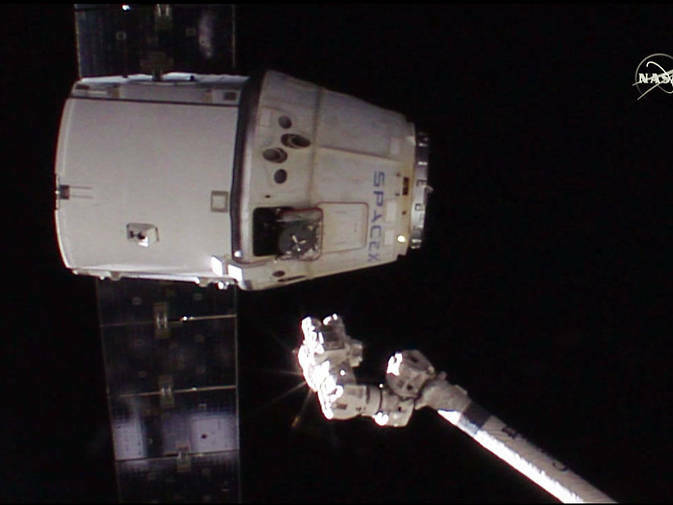 Dragon also returned samples, hardware and data from several biology and biotechnology studies performed on the station. The Advancing Membrane Protein Crystallization by Using Microgravity investigation explored the production of high-quality crystals of the cystic fibrosis protein and other closely related proteins. Because many medically relevant proteins are difficult to crystalize on Earth, researchers attempt to grow them in space to help determine their shape and structure with the hope of improving drug therapies for cystic fibrosis, a genetic disorder that causes severe damage to the lungs and digestive system. Samples from the Advanced Plant Experiments 03-1 will help scientists better understand the effects of microgravity on the development of roots and cells on plant seedlings. Researchers will conduct a detailed analysis of the returned plant samples to determine the molecular and genetic mechanisms that control plant development in microgravity. With this knowledge, scientists may be able to improve agricultural and bioenergy research on Earth, leading to crops that use resources more efficiently. Dragon is the only space station resupply spacecraft able to return a significant amount of cargo to Earth. The spacecraft lifted off atop a SpaceX Falcon 9 rocket from Cape Canaveral Air Force Station in Florida on Jan. 10 carrying more than 5,000 pounds of supplies and elements to support 256 scientific investigations and arrived at the orbiting complex two days later on Jan. 12. The mission was the fifth of at least 12 cargo resupply trips SpaceX will make to the orbiting outpost through 2016 under NASA’s Commercial Resupply Services contract. The International Space Station is a convergence of science, technology and human innovation that demonstrates new technologies and makes research breakthroughs not possible on Earth. The space station has been occupied continuously since November 2000. In that time, more than 200 people and a variety of international and commercial spacecraft have visited the orbiting laboratory. The space station remains the springboard to NASA’s next great leap in exploration, including future missions to an asteroid and Mars.